University of Houston researchers aim to leverage a new, noninvasive brain-machine interface system that taps into human brainwaves to control and command a wearable exoskeleton--a technology that could enable paraplegic kids to walk. A new study out of the Laboratory for Noninvasive Brain-Machine Interface Systems at the University of Houston (UH) has paved the way for a new exoskeleton technology that will be unveiled at Cybathlon in Zurich -- an event where the world's most innovative prosthetic and assistive technologies are unveiled. Jeffrey Gorges, researcher at the university and lead research technician on the project, says that the powered wearable robot has application possibilities for patients of any age suffering from lower-limb paraplegia, but the focus is moving toward a system for children. "This technology has a wide variety of applications, and a huge potential for aiding patients and clinicians across a broad spectrum," he said. "We are specifically focusing on how we can utilize this technology to benefit children for a couple of reasons. First, there is an unmet need. Thousands of children suffer from many forms of debilitating paralysis or mobility impairments that may affect how they interact with the world, how they learn at school, and how they play with their friends." Visit with Proto Labs, the company that helped create the exoskeleton prototype, at Booth #707 at BIOMEDevice San Jose, December 7-8, 2016. Gorges says that adult exoskeleton technologies have long since been developed and have demonstrated many benefits in therapy and improving accessibility -- but no exoskeleton technologies have been made available for children, despite the fact that children may have the most to gain from such as technology given their state of neural plasticity. "When we talk about neural plasticity, we're talking about how quickly a person's brain can adapt to new stimulation, new ways of making connections, and new ways to bypass or retrain areas of the brain that may be damaged," he says. "Children who are growing and developing epitomize a state of neural plasticity in which optimized therapies may have the greatest long term impact." Their latest prototype aims to measure brain activity and use that information to inform mechanical decisions. This suit focuses on a portable, non-invasive method that uses electroencephalography (EEG) through a series of electrodes placed on the head to capture tiny electrical signals from the brain. After years of study, UH researchers have managed to listen to those signals and make inferences about the state of the brain. "We can then translate that into a command for a computer program or a machine," he said. 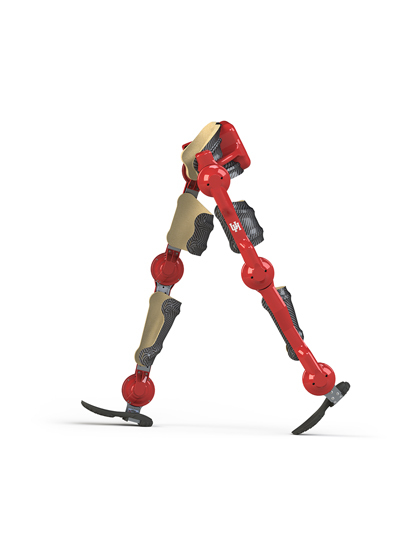 "For the case of exoskeletons, this means that when the user thinks about walking, the exoskeleton walks. The goal here is to not only make controlling the robotic device more intuitive, but to also gain insight into how the brain is functioning, how it reacts to different therapies, and perhaps also promote that neural plasticity by closing the loop between the robot and the brain." To help the process along, Gorges and his colleagues teamed up with Proto Labs (Maple Plain, MN), a company that manufactures custom 3-D printed prototypes. Proto Labs manufactured 90% of the custom aluminum components used in the technology, and with their help, the UH research lab was able to take the robot technology from concept to completion in just 10 months time. "Proto Labs played a big role in being able to push our design forward quickly," Gorges said. "We were able to go from drawing and CAD models to bench testing components within a couple of weeks. Being able to build just a few components, get quick feedback on manufacturability, and still have a real person on the other end to walk us through the process was hugely beneficial." With Cybathlon on the horizon next month, Gorges says the group is excited to test the hardware and learn from their adult pilots before they begin to scale the system down for children, as well as further enhancing the brain-machine interface. "We are excited with the progress that we've been able to make thus far with our adult-sized prototype," he says. "Even this prototype system will have a very real impact on the pilots that are testing the system before we ever move to the pediatric scale. It's very important that we learn as much as we can from our adult pilots before we move the system to children. Also, there is still much to be done and many great opportunities for developing this brain-machine interface. Integrating this type of engaging, intuitive, closed-loop control could have a dramatic impact on the healthcare industry--not just for pediatric exoskeletons, but in many other areas as well."